Today's elite universities and students claim to value diversity. But do they really? Are youth the hope of the future? The answer, according to Harvard researcher Natasha Warikoo, is a nuanced one. Her research focuses on students at elite universities -- the leaders of tomorrow, if only statistically speaking -- and her interest lies in how they understand diversity. If older generations tend to be characterized by a greater degree of social conservatism than younger generations -- so the stereotype of ‘rebellious youth’ suggests -- then surely the younger generations must have a more open and progressive frame of mind? Surely they’ve absorbed something of the imperative for a more diverse and equitable society? What do youth at elite universities -- Oxford, Cambridge, Harvard, Brown -- think of diversity? Do they support affirmative action programs? How do they understand systemic racism? Warikoo embarked on her research expecting to find that students at elite universities would be more open to affirmative action, and have a deeper critical analysis of the notion of meritocracy in the contemporary US and UK. After all, unlike their peers, they’ve never (or rarely) experienced setbacks in their lives: they’ve achieved admission to the most competitive universities in the land. Surely they have nothing to grumble about, or to blame on the perceived injustice of affirmative action? Surely the underrepresentation of minorities on American and British campuses leads them to recognize the shortcomings in their universities’ claims to meritocracy? Yet far from being rebellious and critical, Warikoo found that most students at elite universities in the US and UK have absorbed their universities’ claims about meritocracy and equality. With few exceptions, they defend and parrot the claims of their administrators that admissions is based on merit and equal opportunity. Warikoo’s disappointment at not finding more critical and rebellious youth -- all stereotypes aside -- is almost palpable at points. Which is not to say that these students’ perspectives on race and diversity are not intriguing and important to understand. After all, as Warikoo notes, these are more likely than not to be the leaders of tomorrow -- in politics, finance, and intellectual life -- so it’s important to know what beliefs and understandings they’re cultivating in their important formative college years. Warikoo finds a distinction between students at American and British elite universities in this regard. Both groups of students have developed what she refers to as ‘the diversity bargain’, but it assumes very different forms in each country. The American ‘diversity bargain’ is the more fully fleshed out of the two. In the US, students are more aware, more compelled, and more concerned about issues of race. Not being racist is a moral imperative among American students, and American students (particularly white ones) experience tremendous anxiety and fear that they might do something that is or is perceived to be racist. This shapes racial discourse in America -- a reticence to tackling tough issues; a tendency to avoid them lest they generate offense. Americans perceive a lower threshold for the ‘hurtline’ -- the point at which discussion or humour might cause offense. They are, some might say, more prone to be ‘politically correct’. Many of them profess to support diversity and affirmative action. Their educational institutions, too, feel a greater sense of responsibility to tackle the problem of systemic injustices, through affirmative action admissions, for instance. This is in part because of the more powerful legacy of civil rights struggles in America, which led to the admission of a cohort of African Americans in the university system who continued the fight for greater equality as they rose into positions of prominence in academe. American institutions are deeply concerned with the need for diversity. But there’s a catch: a ‘diversity bargain’. Diversity is perceived as something that's intended to benefit everyone, including white students. It isn’t defended as being a matter of social justice, but rather as the best way to equip young Americans to succeed in today’s world. White Americans (and other students with privilege) see diversity and affirmative action as something which is intended to benefit them, and so long as it appears to be doing that, they’re okay with it. But when diversity places barriers in their way -- when they experience rejection in admissions or job applications or anything else which they can find reason to blame on affirmative action -- they’re quick to criticize it, or to blame it for their own shortcomings. This is the result of what Warikoo calls a ‘diversity frame’ of understanding affirmative action, and it was one she and her researchers found common among American students. There are other frames: the ubiquitous ‘color-blind frame’, in which students profess that everyone is equal; and the ‘culture of poverty frame’ in which they find inherent faults in the marginalized group. A few students held a ‘power analysis frame’, the one Warikoo herself seems to favour and was hoping to find, which recognizes systemic power imbalances and is more associated with a social justice imperative. In the UK, Warikoo found a different version of the ‘diversity bargain’. UK students, she found, felt less of a moral imperative to not be seen as racist, and found it easier to feel confident in shrugging off such accusations. Many of them were willing to push boundaries American students were not -- making racist jokes, for instance. While American students considered silence in the face of racism to be a moral failure (not calling out racist jokes), British students didn’t feel the same imperative. They also did not, by and large, feel their universities had a responsibility to tackle the problems of underrepresentation of minorities on their campuses. Indeed, they were not as sensitive and cognizant as American students of the deep-seated social inequities which led to the exclusion of marginalized and minority students from elite universities and other bastions of privilege. They felt their university admissions systems should ensure the top students got in, regardless of what advantages and privileges those students had. In other words, they too absorbed the messaging of their university administrators -- and its more overtly aristocratic legacy compared to American universities -- without much critical analysis. But there came a trade-off, too. Privileged (read: white) UK students were less likely to question the successes of their minority group peers, since there was an accepted faith in the meritocratic basis of their university admissions systems. American students, while holding a more nuanced understanding of racial inequality and social injustice, were also quicker to resent and blame the mechanisms put in place to tackle those inequalities, especially when they experienced personal disadvantage as a result (or as a perceived result) of those equity mechanisms. They suspected many of their minority peers were there thanks to affirmative action, not thanks to their own accomplishments and abilities. British students on the other hand, were less inclined to feel that way. 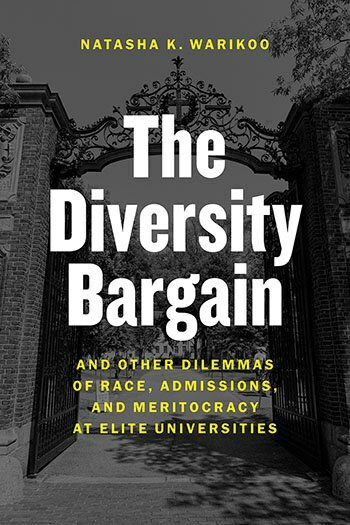 Warikoo’s fascinating book, The Diversity Bargain and Other Dilemmas of Race, Admissions, and Meritocracy at Elite Universities, offers a fascinating, erudite and scholarly study of these phenomena. Through interviews with dozens of students at four elite universities in the US and UK, she explores the nuances of their perspectives on these issues. She also looks at different diversity-oriented programming offered at these campuses, and the varying impacts they have on the frames through which students understand their respective ‘diversity bargains’. There's a qualified sense of hope here: it would seem that the powerful legacy of anti-racist struggle in the US -- civil rights marches, affirmative action, Black Lives Matter, etc. -- has had some impact on America’s students, compared to their British peers who don’t have a similar legacy. The American students Warikoo studied care very passionately about not being racist. They have a greater understanding of systemic inequality. But there lingers a self-absorbed individualism, a ‘what’s in it for me?’ attitude, which sees many white students embracing diversity for the benefits it brings to them personally, rather than the justice it seeks to effect in society. It would be interesting to see a comparable study conducted at less ‘elite’ universities, and whether students with a less privileged background, and more diverse peer group, would feel differently. Warikoo offers some parting suggestions for tackling the issues she identifies. If meritocracy is supposed to be an admirable goal -- as many in our universities, and society, generally believe -- then universities (especially elite ones) ought to do a better job of defining what the goals of meritocracy and merit-based approaches are. What Warikoo means by that, is that universities ought to more clearly acknowledge the important civic role of universities in enhancing opportunities, inclusion, equity and democracy in our society. Secondly, and perhaps most importantly, universities need to do a better job of framing affirmative action and race on campus. They need, in other words, to inculcate in students more of a power analysis frame -- a deeper understanding of the role race plays in our society, of the histories of exclusion that we all too often gloss over or awkwardly ignore, of the ongoing differences in status and resources in our society. Finally, she reminds us to remain humble and acknowledge that meritocracy is probably never fully achievable. We will never be able to overcome all the inequalities and disadvantages in our society, so let’s not uncritically (and arrogantly) assume that we ever have the full answer, or that our methods, however laudable, don’t always exclude someone. To this end she offers an intriguing idea: allow admission to university by lottery, as opposed to the fraught and imperfect methods we currently employ which all too quickly (and often incorrectly, or incompletely) claim to reward merit and transcend bias. If admission were based on lottery, it would more truly underscore the element of ‘luck of the draw’, which defines every successful student’s experience to some degree or another. She’s not entirely serious about this proposal (she claims), but it offers an intriguing prospect. At the very least, it reminds us that we still have a long way to go in developing a post-secondary system and society that is truly fair, equitable, and meritocratic.